by Saunders Mfg. & Mktg. Manufacturer: Saunders Mfg. & Mktg. I just bought this bookshelf today, and my husband decided to put it together.It's easy to do, even without reading the directions.I was also a little disappointed that it was not taller.I bought this item as a re-sale after it was returned by a previous shoppper -- only to bring it home and discover the silver disc at the bottom (which serves as a third leg for the piece) was Missing.The bookshelf is currently holding itself up with -- a book.It looks nice in our 2nd bedroom, though, and doesn't take up much room.The open concept does make the room seem bigger, vs. packed. Organize office, closet space easily. Dust-free wire storage system consists of 14" square interlocking grids and heavy-duty plastic connectors for quick assembly without tools. 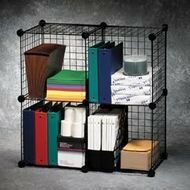 Each cube provides 50 pounds of storage capacity. Four-cube set contains 17 grids and 20 connectors. 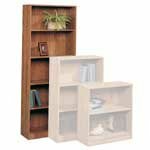 Combine multiple sets for additional storage. Four cubes per set. Shpg. wt. 13-1/4 lbs. Assembly required. 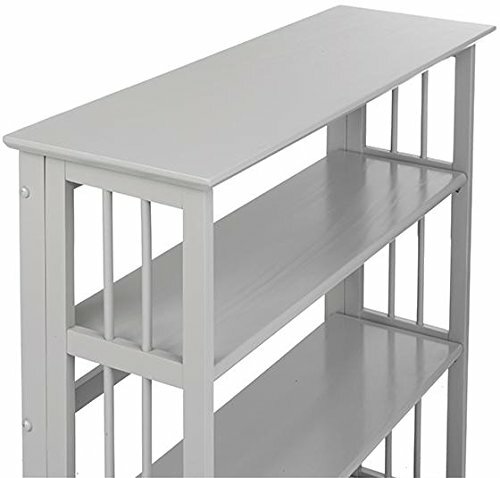 48"H x 31"W x 12"D.
Solid surface shelves prevent small items from falling through. Legs/uprights, constructed of heavy wall ABS polypropylene plastic, interlock for extra strength. Lighter duty, open shelf system. 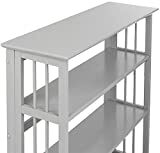 Injection-molded shelf engineered for 75 lbs. per shelf load capacity. 16" clearance between shelves. 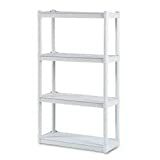 Shelf size: 32w x 13d x 2-3/4h. Overall 60" high. Shpg. wt. 18 lbs. Easy assembly or disassembly. 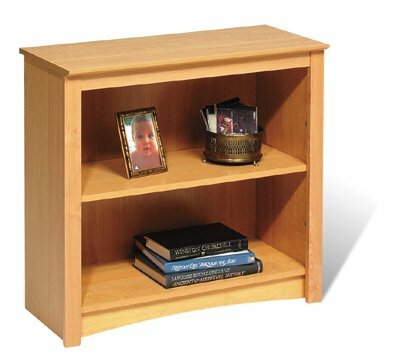 Three adjustable shelves. Shpg. wt. 77 lbs. All solidwood mahogany shelves! Heavy gauge material! Top quality productions!